Many (if not all) of us are using social media on a daily basis. Some of us restrict our time online to personal social interactions, while others use these powerful networking platforms to help promote our architectural businesses. Social media can certainly be a powerful tool, but if not carefully and intentionally managed, our time online can waste away the precious few hours that we are afforded each day. There are a dozen different channels from which to choose. Each has its strengths and each has its weaknesses. Understand the context to which you are posting. Take time to understand the demographics for each and confirm that your prospects are, in fact, available and ready to engage at the platforms on which you choose to spend your time and money. One platform may be your personal favorite over the many others, but are your prospective clients enjoying their time on that same platform? I’ll save the topic of which platform works best for architects for another post. Let’s assume you have done the work to determine that one platform works best for your business. With the context of that platform understood, how might we be more intentional about what we are actually posting? If we are going to be sharing information each day, how can we fine tune each post in a way that will make your social media content more sharable? We have all seen content go “viral”. Maybe its a powerful video, awe-inspiring photo or an interesting article. What makes people privately consume some content, keeping it for themselves and what makes them compelled to share other content with family, friends and network? What makes some content “contagious”? There are specific principles involved with this “contagious” content. 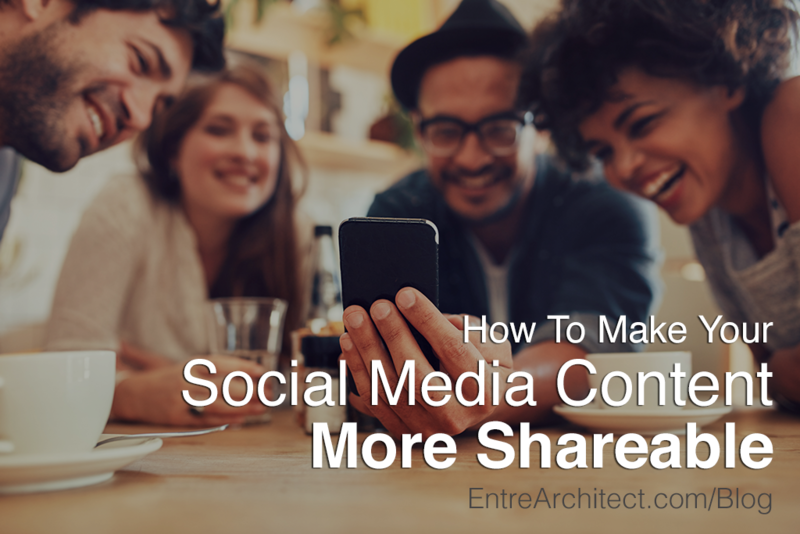 There are ways to make your content more likely to be shared. Researcher and author Jonah Berger in his book, Contagious: Why Things Catch On, identified six principles at work in the most shared messages, products and ideas. He calls these ingredients his 6 key STEPPS that cause things to be talked about, shared and imitated. Social Currency – Provide valuable symbols of status that people can show to others. Make people feel like “insiders”. Provide them with information that others will find valuable. Give them knowledge that others want and need and people will share it with those who want and need it. Triggers – Design products and ideas that are frequently triggered by the environment and cues within. Where are our clients making the decisions that lead them to hire us? Most residential clients collect “wish list” images before they ever come to us for architectural services. Could we develop a tool that helps them with the process of dreaming before their project ever becomes reality? Emotion – Focus on feelings. The most viral content surprises, makes people laugh, lights them up with anger or gives them a sense of awe. How can we develop content that makes people sense a powerful emotion? Public – Design initiatives that advertise themselves and create behavioral residue that sticks around even after they bought the products or espoused the idea. My friend Sheri Scott’s app, Nester, provides a client with a simple tool to track and document the process of architecture through photos. When the project is complete, a book is published with the click of a mouse, ready to share with all their friends. Practical Value – People like to help others. Develop a useful tool or checklist that makes the lives of your prospects easier or more manageable. If we show our prospects how our products and services will help them save time, live healthier or save money, they’ll share it. Stories – Wrap your story around a broader narrative. Like a “Trojan Horse”, integrate your idea into the narrative, so that the story can’t be told without it. Are your designs or services developed in a way that a client can’t share their experience without talking about how you served them? Social media is a powerful tool when used effectively. Consider these six principles as you develop your social media content and watch your readers become your greatest advocates. Question: Have you had social media content “go viral”? Share your story and identify the principles used from above. Share your thoughts below in the comments of over at The EntreArchitect Community private Facebook group.